I am currently running a sale on my etsy shop for Memorial Day. Take 25% off your purchase on the entire stock. Sale runs now through May 31. 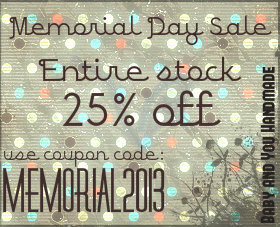 USE COUPON CODE MEMORIAL2013 AT CHECK OUT. Remember, if you see anything listed in the shop that you'd like customized (different color, style, size, etc), let me know and I'll work with you to make whatever it is you'd like.